I don't blame you at all for refusing to collect Illinois state highway markers. They're egregiously unoriginal. Ew Gross. Same for Montana and Indiana which pretty much have the same style. Blank squares and blank circles are also lame. At least they got the state name with them, the all time worst and I have a ton of them is Connecticut. Basically it's just a white blank with black trim....that's it. I ran into a guy who was trying to sell a bunch of them that were highways that went through or were around a town I lived in. Considering they were $5-$10 dollars a pop I bought the whole lot and accumulated a couple more along the way. 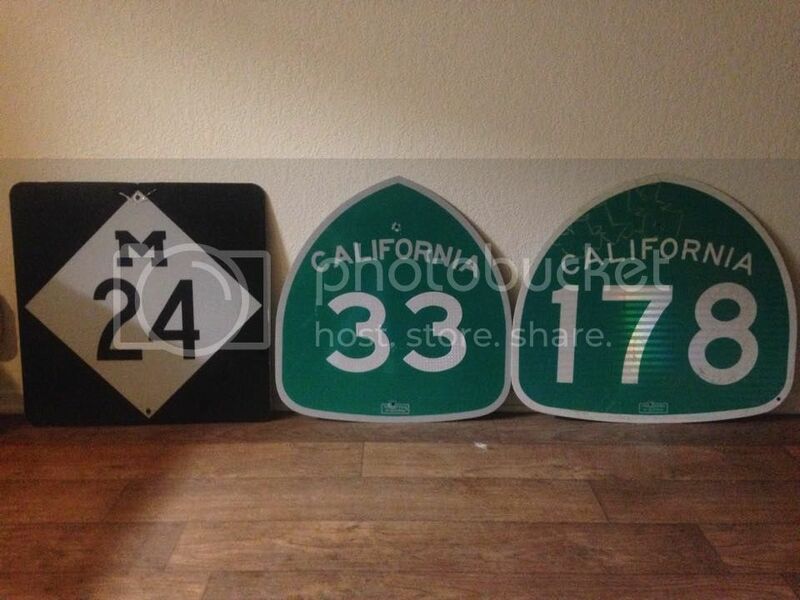 My collection isn't large, and it is a mix of roadway & railroad signs. My most recent acquisition is the AR 335 and NORTH banner. For both I paid $45 from an antique shop in Minden, LA. The shield & banner were in 2 different rooms of the store so if they really were together in the field is unknown. But the finish on both signs feel the same. Dig the US 65 sign, that's one on my short list that I still need to find. My first sign ever...an old speed limit 25 sign that has disappeared over the years...was given to me by an uncle when I was 6 years old. I have lived in this house all of my life except for my college years. It must've disappeared then. 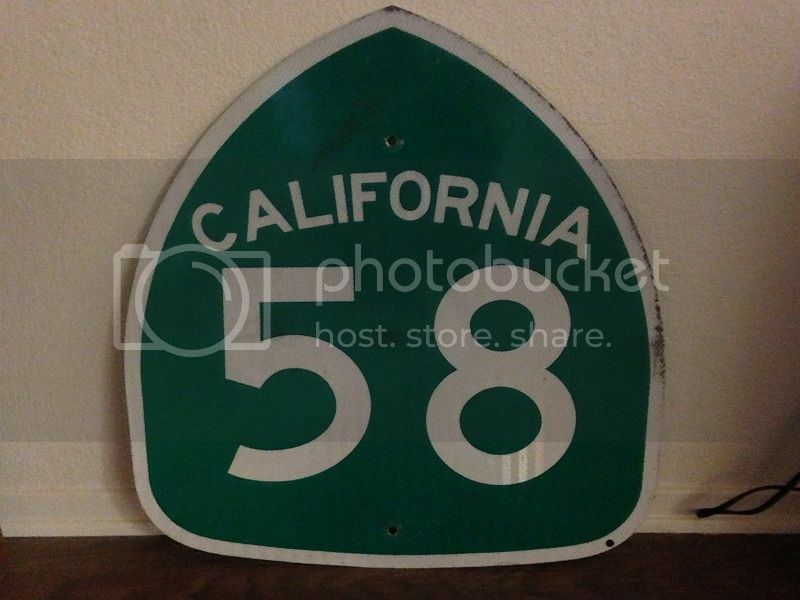 My LA 507 sign was acquired one day while riding my bike with a pair of pliers in each back pocket. The sign had been knocked down for a couple of years and forgotten. My siblings applied the red spray paint soon after, which happened to be the color of my face when I discovered it. The railroad signs were acquired on a few times down the tracks. These had been replaced with new signs and were lying on the ground. A couple of those sign posts came home then as well. In fact, I use an old milepost sign and a couple of switch targets as my E-911 address sign in front of my house. US 65 was acquired when I worked road construction in Pine Bluff, AR (I-530 & the new US 63/79 road to Althiemer, AR). The sign assembly was knocked down and was to be removed. The AHTD inspector I worked with gave me permission to start the disassembly process. The red STOP RR CROSSING sign was in a shop building at my current employer. I was told to take it home. LA 150 was knocked over and "forgotten about" by the sign repairman. I thanked him when I left & picked it up later that day. Blacksnake Rd was found at a dumpster site...literally. Laying on the ground next to dumpsters. 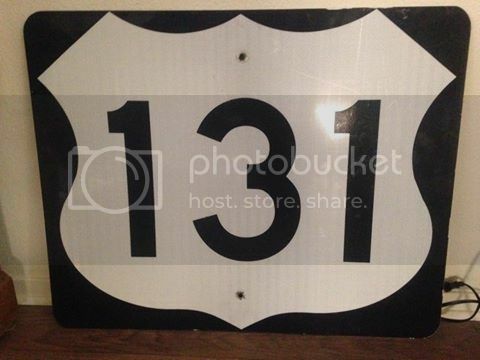 I don't know where it came from because no town or road department anywhere near here uses that style or has that name for a road. It is a pair of embossed blades bolted together on the ends. 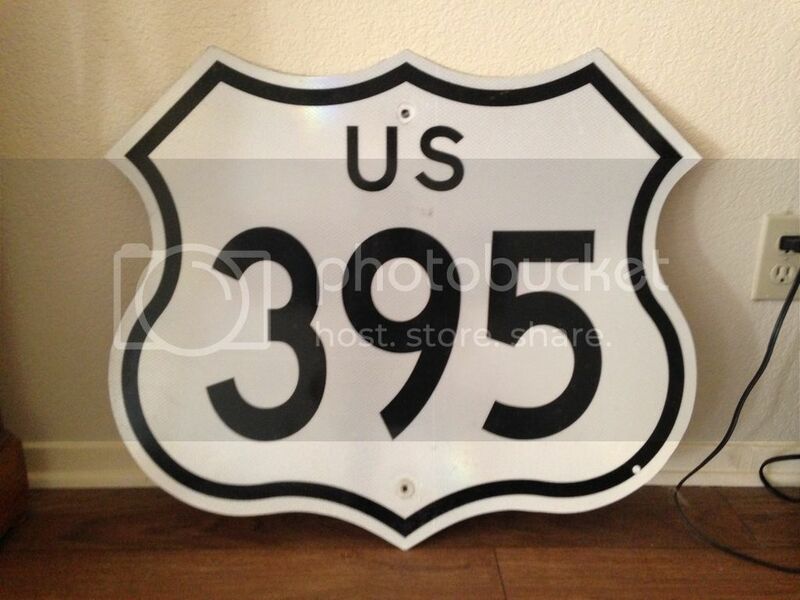 The AR 335 cutout & NORTH banner were purchased for a total of $45 from an antique store in Minden, LA. The newer reflective NORTH was purchased from a vendor at the Bonnie & Clyde Trade Days in Arcadia, LA for $10. 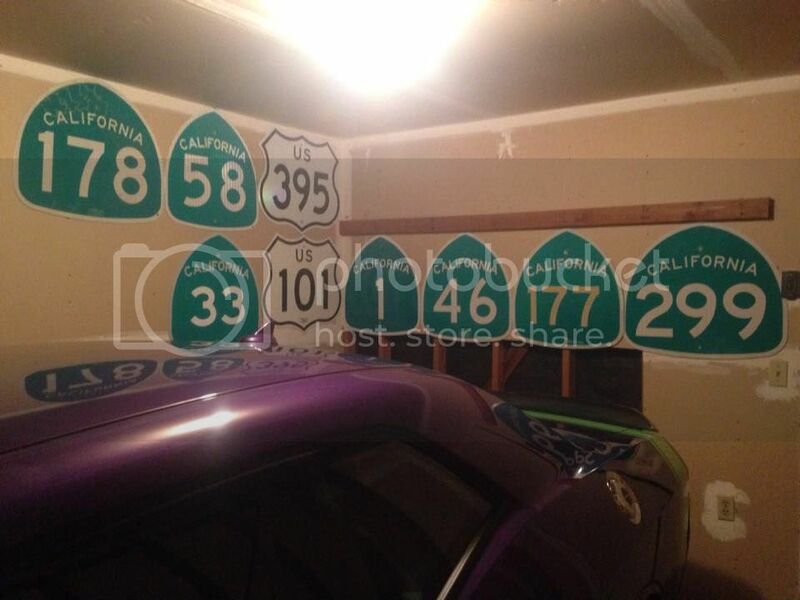 So I have had many procurement methods for my sign collection. But the one thing I haven't done is taken a sign that was in use off of a post. That I won't do. Yeah that's pretty weird. I'm taking it by all the New Jersey stuff in the video that it's some sort of east coast thing? Weird to see anyone want a U.S. 395 all the way out there. They had a really big Exxon sign on the floor also. It may be time to stop buying signs since I don't think I'll find one better than this! 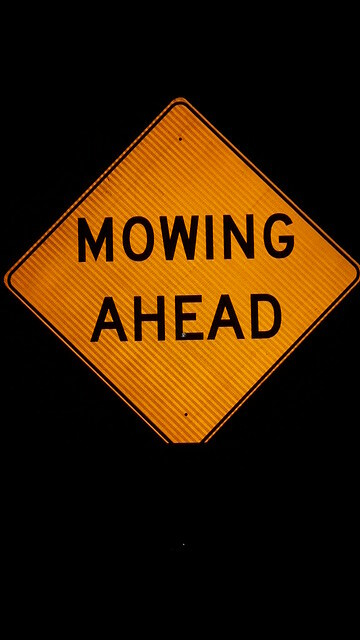 This sign arrived at my railroad's MOW shop last year in error. I asked, I received. 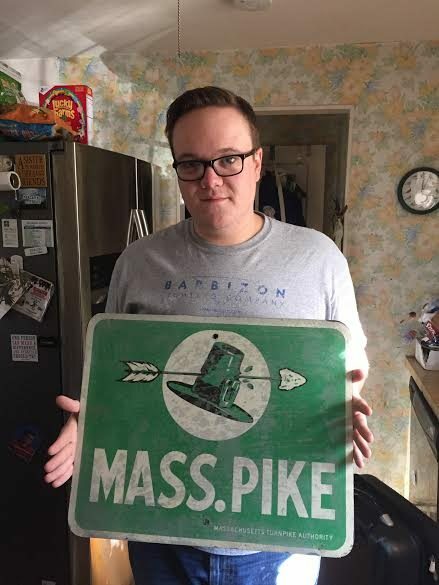 Ian, that Mass Pike shield is one of the best ones, for sure! Traffic lights have always been my thing, and I have collected a bunch of them in the past, and then pared them down to the few (4) that I really like best. I'm having fun with signs right now. 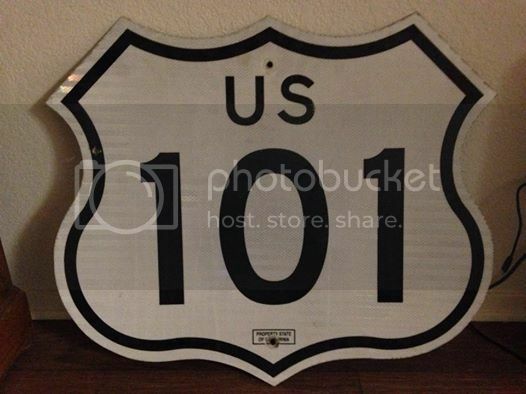 I prefer signs with geographical names on them (e.g., highway shields, directional signs, etc.) over traffic control signs (e.g., Stop, Yield, Divided Highway, etc). 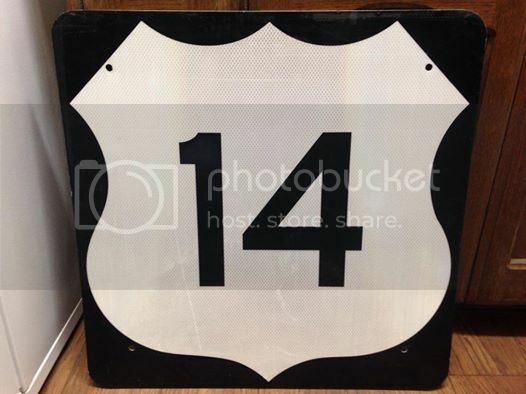 As with traffic lights, I look for more local pieces from NJ and New York City, though I wouldn't turn down a good offer for a cool shield like Ian's Mass Pike shield above. And, of course, older is better! 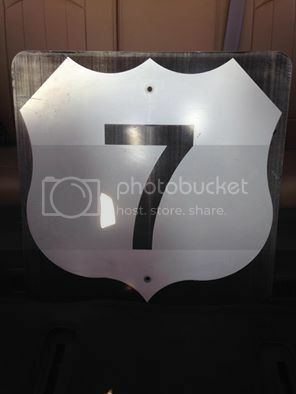 My sign collection is visible on bloat-o-bucket HERE. It is set to private & cannot be viewed. Thanks, I think I have opened up the permissions...not sure though, because the site is so damn wonky, it wasn't clear if the setting took. I'd like to see the update...what you have there is great. Out of idle curiosity, does anyone have a BGS? I can imagine they'd be hard to store, but they're definitely unique. Check out 559junker on eBay, he gets a BGS now and then. He was selling a BGS with a "CA 152" on it awhile back for relatively cheap. The shipping cost a mint though and I don't have a vehicle large enough to something of that size into otherwise I would have put a bid in...figure you'd be interested in some California stuff. this - I'm hanging this on the driveway or above the front door. this - It's going in my or my parents room. this - This has to be on the driveway. "In the driveway" could = easy theft. Well, I don't care if the red stop sign disappears. I'm concerned about the yellow one. I still want to hang it outside, though. I could use a ladder and try to use a screwdriver and hang it that way. Might have some competition from me on one of your signs.